I’m in Manhattan today. This trip, I’m staying at a new hotel, the Andaz Wall Street. It’s been something of a revelation. Normally I like older hotels, but what I really search for is a reasonably priced hotel within walking distance of my destination for the day. The Andaz fits the bill — and happens to be ultra-modern and ultra-cool, besides. My room looks like it was designed by Frank Lloyd Wright on a feng shui rush. 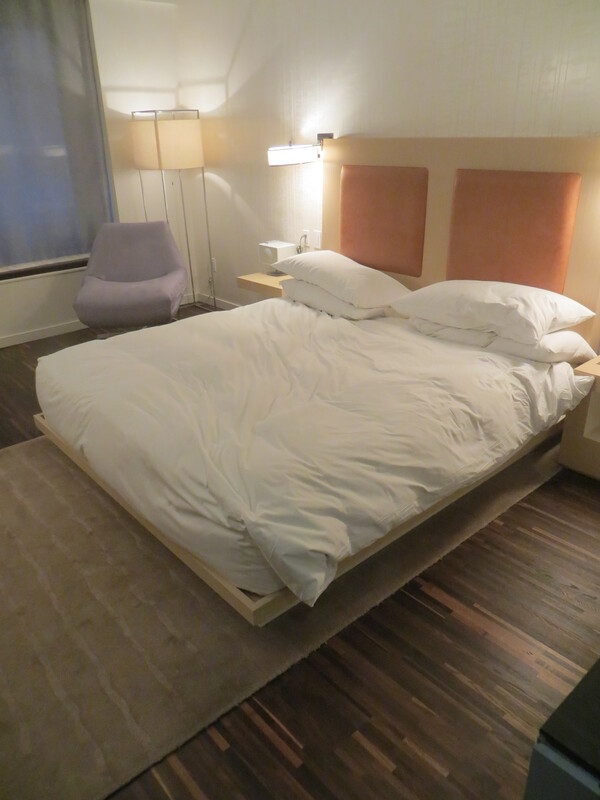 The sleeping area is all blonde wood against a dark wood floor, with a bed that is low to the ground. The light fixtures are metal frames with a canvas covering, and the reading chair and desk chair are of sharp, contemporary design. The feeling is bright and open and airy, and there’s not a bit of clutter to be found — except when the weary traveler lets his bags drop to the floor with a clunk. 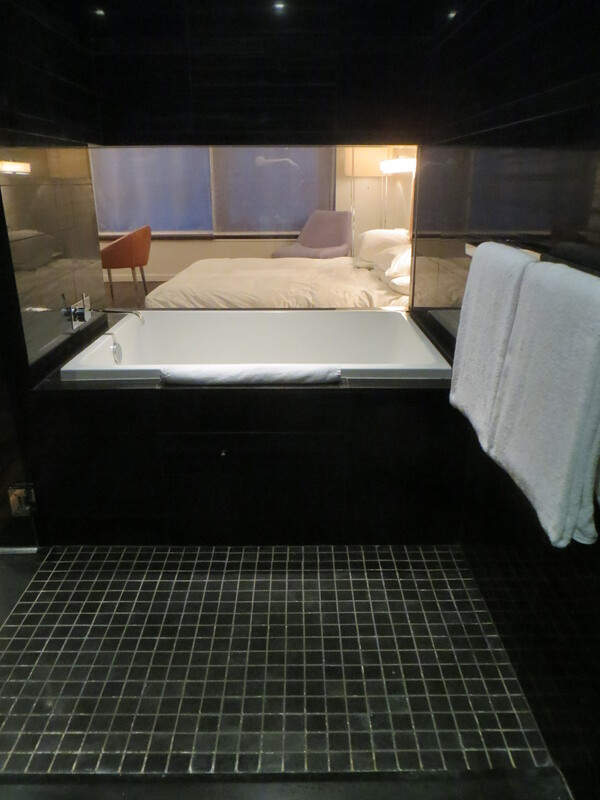 The bathroom area also is striking — a huge, black, walk-in shower where you can take three steps in any direction before hitting a tiled wall and a separate bathtub with a large window looks out over the sleeping area. (My Midwestern sensibilities suggest that the reason for this configuration is to allow a bather to watch the big-screen TV in the bedroom.) The sink and vanity area are in a separate room, and the sink is a glass bowl. There are some other interesting aspects to the room, too. The light fixture panels right above the nightstand have buttons that are clearly labeled, so you don’t have to guess how to turn something on or off. I particularly like the “All Off” and “All On” buttons. 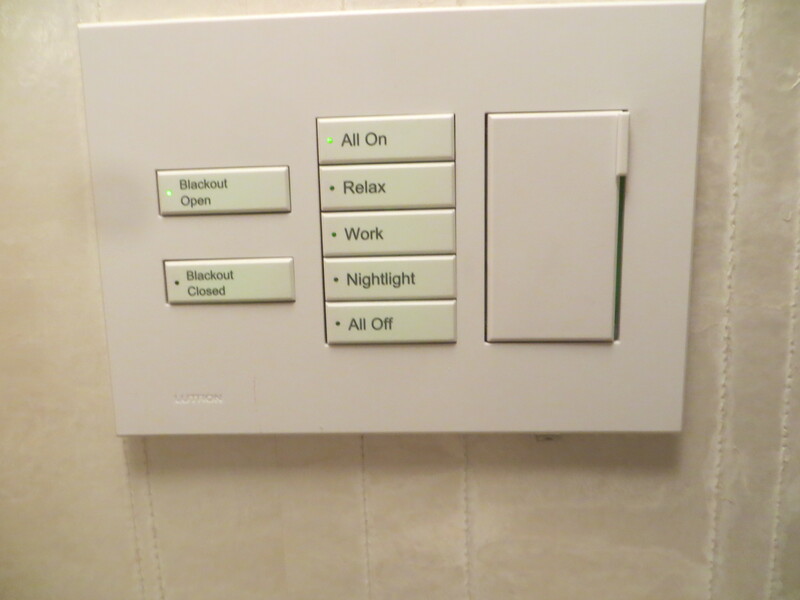 The two “blackout” buttons control the window coverings. And, rather than the standard hotel room pen that lacks ink or skips when you use it, the Andaz provides a black pencil, complete with sharpener and separate eraser. It’s all very sleek — and comfortable, too. After we arrived last night, one of my traveling companions said “I’m not sure I’m cool enough to stay here.” I know I’m not cool enough to stay here, but I’ve enjoyed this visit and a peek at a different approach to hotel room design. When we sold Mom’s condo recently, our realtor gave us some advice about how to “stage” her home. Less is more, he advised. That meant emptying out the place to allow the rooms to seem more spacious and airy. It also meant leaving only a few well-positioned items on shelves that previously were crammed full. His techniques worked. Mom’s place never looked so good, and we got an offer we accepted the first weekend it was for sale. Whether it’s “staging” or feng shui concepts, the experts agree that decluttering is a key first step to making your home look better. If it works on a place that is being sold, why not try it on a home that is still being used? I decided to apply the approach to the shelves in our study. Over the years, new books, papers, photos, and various random objects were deposited there until they were overflowing. It was really bugging me, so on Saturday I decided to tackle the shelf project. The papers were stored or pitched, the photos taken away, the random objects were thrown out or placed with more care, and the books were carefully evaluated for likely future reading. We figured if we hadn’t read one of the later books in the Clan of the Cave Bear series at this point, we probably weren’t likely to do so now. Through that process, three bankers’ boxes of books were taken off the shelves. 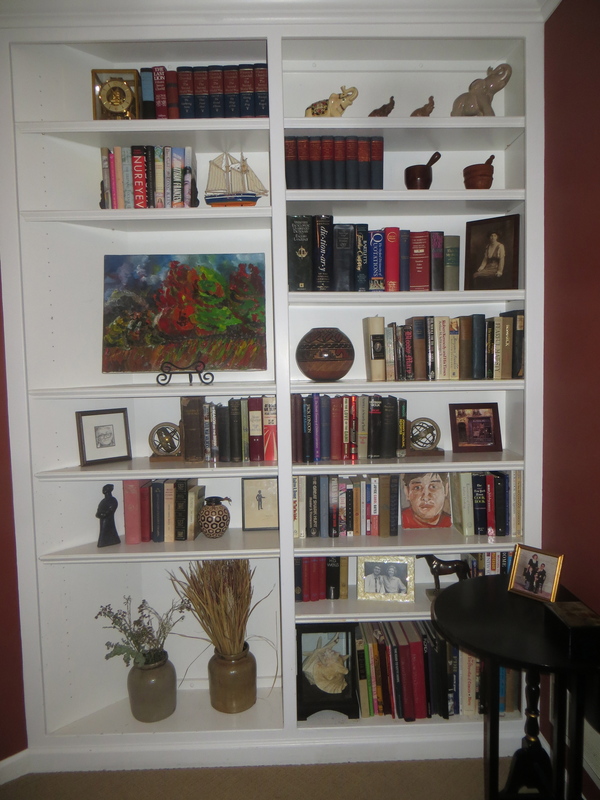 When I was done, I was happy with our work and thought our shelves looked much better. The study felt like a better place. A feng shui expert, or a realtor, would probably say that we still have a ways to go — but it’s a start.